1 of 1 In large bowl, stir together pears, cranberries, brown sugar, cornstarch and lemon rind. 1 of 5 Roll half the pastry out to 12-inch round; press into bottom and up sides of 9-inch pie plate. Refrigerate. 2 of 5 Roll remaining pastry out to 12-inch round. Using sharp paring knife and ruler, cut into 16 equal wedges (see photo 1, below). Reserve 8 wedges. From remaining wedges, cut out 1 1/2-inch star with cookie cutter. Cut out fifty 1-inch stars and nine 1/2- or 3/4-inch stars. Reroll scraps as needed. 3 of 5 Spoon pear filling into bottom crust. 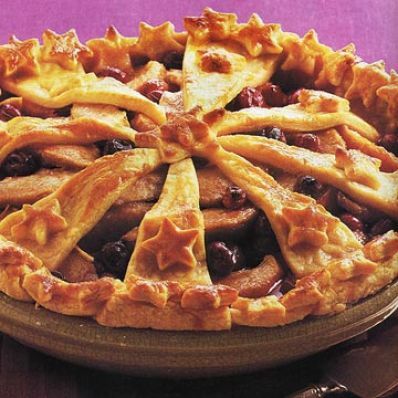 Arrange 8 reserved piecrust wedges on top of the fruit in a wheel-spoke pattern, with point of wedges in center of pie (photo 2). Tuck wide ends under bottom crust and crimp (photo 3). Brush wedges with egg white. 4 of 5 Place fifty 1-inch stars around edge of pie. Place large star in middle of pie. Top with one of smallest stars, using egg white as glue. Place the remaining smallest 8 stars in middle of each wedge, attaching with egg white. Sprinkle top of pie with granulated sugar. 5 of 5 Bake in 425 degree F oven for 15 minutes. Cover edges of crust with foil. Reduce heat to 350 degrees F. Bake 65 minutes or until filling is bubbly and lightly thickened. Transfer pie plate to wire rack; let cool completely. Makes 8 servings. Per Serving: 0 mg chol., 258 mg sodium, 5 g fiber, 16 g Fat, total, 68 g carb., 4 g sat. fat, 4 g pro., 0 null Mark as Free Exchange, 420 kcal cal.